TO UNDERSTAND WHY IRAN was nixed from the Syria peace talks is to discern the underlying foundation of US foreign policy. The fulcrum upon which US foreign policy turns is the worldview which American Jewry envisions, formulates, and drafts into legislation for its Jew-bought hacks on Capitol Hill to implement. With events in the Middle East so dear to American Jews vis a vis the hegemonic program of Israel, the emerging influence of Iran strikes dread into the heart of the Jewish psyche. 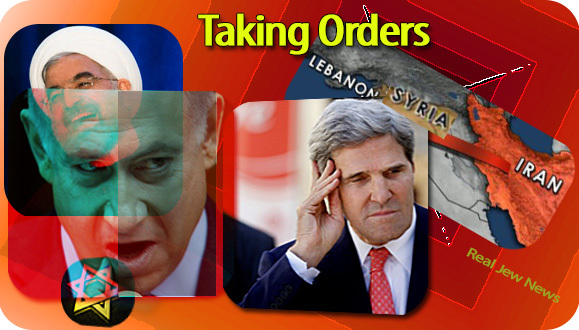 While many are perplexed by Jew-owned Kerry’s insistence that “Assad must go” — a virtual non-starter for solving the Syria crisis — the more astute see the conflict in wider terms than an internal scenario limited to Syria alone. The Syrian conflict is a battle for Middle East hegemony between the Israel-Saudi-America Axis and the Iran-Syria-Hezbollah Axis. The Jewish lie that “Assad is a torturer” or “democracy must replace a dictatorship” is pure Jewish bulls##t designed to deceive the Goyim masses. Jewry’s aim is to deny Iran the “strategic prize” of the Middle East, namely, Syria’s strategic value that geopolitically reaches from Iran to Lebanon. And powerful Jewish Lobbies throughout the Western world have shills like Kerry to mouth their “Assad must go” mantra in order to reach their own strategic goals. 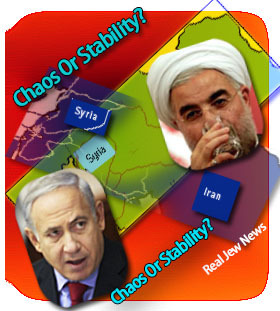 JEWISH SUPREMACY is hitting a brick wall with the emergence of Iran as an economic world power. At Davos this week, Iranian president Rouhani announced his country’s goal of becoming one of the world’s top ten economies. Iran’s economic goals hinge on it pursuing a “Greater Middle East” of its own. And Israel doesn’t like the competition. “What is happening in Syria is not an internal issue but an ongoing conflict between the Axis of Resistance and its enemies in the region and the world. Iran will not tolerate, in any form, the breaking of the axis of resistance, of which Syria is an intrinsic part.” View Entire Story Here. In Patrick Seale’s, The Struggle for Syria, he argues that those who aspire to control the Middle East must first win over Syria. “Whoever controls Syria or enjoys her special friendship could isolate other Arab states and bow to no other combination of Arab states,” says Seale. WE CAN EITHER have a stabilized Middle East with broader Iranian influence OR chaos and bloodshed that Israel and its Saudi ally bring to the region. But here in Jewmerica we’re stuck with a skewed & jewed foreign policy that bows to Jewish supremacy leaving us the laughing stock of the world. Jewmerica IS the laughing stock of the world with it’s skewed & jewed foreign policy that among countless other foibles nixed Iran from the Syria peace talks. Without Iran as an official mediator of the Syria crisis we’re STUCK with MORE of JEWmerica and its support for imported terrorists in Syria. What can SAVE US from the JEWS and their strangle-hold on US policy? THREE DAYS AGO I received an email from a long-standing benefactor whose substantial funding has been going for my rent and living expenses. Not only is “America the laughing stock of the world,” most off us think it’s okay to sit and do nothing. We all know Jews are two-headed hydras, who whenever foiled, grow new outlets to attack their prey with. Not me, they will have to kill me first. Luckily, there is a sign of rebirth. I have awakened both youth my age and elders from providing them this website. Numbers population-wise are still on our side. If we put two and two together than the Jews will be sent packing. Hail Christ and our rightful entitlement to truth and freedom from Zion’s poison. This is great, dear +BN. You’ve presented an entirely different geo-political perspective which hardly ever trickles down to us peasants without being framed through Israhell’s Judeo-centric world view, or alluded to by the political elites as some kind of “clash of civilizations,” or religious sectarian warfare, or “they hate our freedoms,” or whatever. Iran and Syria are each modern state republics. Saudi Arabia, on the other hand, is a feudal state ruled by a monarchy and controlled by just one family, the House of Saud. There are some 15,000 members of Al Saud and all its branches, and they all consider Saudi Arabia their own personal property. Saudi Arabia is essentially all Muslim, it is true, but a very significant percentage of the population are repressed Shiite Arabs, not Wahabi/Sunnis. The Shiites’ ancestral lands also happen to be the oil bearing provinces that make the Saudi royals filthy rich, while the Shiites labor for pittances in the KSA’s petrol industry without any mineral/oil rights to their native lands or royalties from oil production. I understand these Shia Saudi Arabs also look to Iran for political inspiration in their decades of labor to obtain ethnic rights from the Saudi monarchy, not religious leadership, even though Iran is largely Shiite Muslims as well. You’ve come up with some substantial food for thought. Seale’s observation that “Whoever controls Syria or enjoys her special friendship could isolate other Arab states and bow to no other combination of Arab states,” explains so much as to why the Israhell-JewSA-Saudi is so hellbent on pounding her into the ground on the one hand, and why they worked so hard to keep Iran, Syria’s long-time ally, out of the peace talks in Geneva on the other. They need a puppet regime in Damascus, not one which will insist on and enforce Syria’s independence and sovereignty. I was 27 when the 1979 revolution occurred in Iran throwing off the yoke of at least 3/4 of a century of exploitation by the Great Powers. It was more of a nationalist, anti-imperialist revolt than strictly a religious one. The Iranians have a very strong national identity because of their history spanning all the way back to biblical times, but colored by modern events as well. Not many Westerners know, for example, of the Great Famine and Genocide of Iranians from 1917-1919 during the British occupation. “As many as eight to ten million Persians perished because of starvation and disease during the famine of 1917-1919, making it the greatest calamity in Persia’s history. “In this book, Mohammad Gholi Majd argues that Persia was the greatest victim of World War One and also the victim of possibly the worst genocide of the twentieth century. I hope I live long enough to see the first Iranian engineered and manufactured cars imported into Jewmerica, that are fueled by Iranian petroleum (or perhaps even uranium, lol). Great article dear +BN, and thank you for opening my eyes a little more, and seeing things in a different way. Any info on the strange goings on in Ukraine? [Heavenly Father] O deliver not the soul of thy turtledove unto the multitude of the wicked: forget not the congregation of thy poor for ever. Have respect unto the covenant: for the dark places of the earth are full of the habitations of cruelty. O let not the oppressed return ashamed: let the poor and needy praise thy name. Arise, O God, plead thine own cause: remember how the foolish man reproacheth thee daily. Forget not the voice of thine enemies: the tumult of those that rise up against thee increaseth continually. But unto thee, O God, do we give thanks, unto thee do we give thanks: for that thy name is near thy wondrous works declare. When I shall receive the congregation I will judge uprightly. The earth and all the inhabitants thereof are dissolved: I bear up the pillars of it. Selah. The wicked shall surely have their reward. Amen. Here is something a friend of mine stumbled upon. He said he copied and pasted the writing for other reasons. After all the mass executions, ethnic cleansing, holodomor and other atrocities committed on the Ukrainian people by the Jew, you’d think the nation would be the last on Earth to call upon the greatest evil that’s ever befallen their lands to come back and torture them some more. Alas, humans are gullible and easily invite dark history into their own homes to repeat itself. After ransacking Spain, Cyprus, Greece, Ireland and other European nations, Jew has become too keen on opening up an attack corridor to Iran by forcing the Russian Black Sea Fleet to leave their Black Sea port of Sevastopol. What we see happening in Ukraine right now is a carbon copy of what’s been going on in Syria and Egypt for a few years. Jew identified a few troublemakers and public figures and made them an offer they couldn’t refuse. Supported by the manipulative pro Jewish media that twists the facts to fit their psy-ops goals, and trained in the art of social dissolution by Mossad, CIA and MI6, the protesters were able to trick large masses into falling for the trap. Jew made previous attempt to take over Ukraine in 2004 (Orange Revolution I). That time it didn’t work out, but after the Federal Reserve successfully nuked the world’s economy in 2008, Ukraine was forced to borrow $16 Billion from the International Monetary Fund (Jewish favorite tactic of eternal enslavement of nations), opening a whole new field of possibilities to drain battered nation of the last drop of its blood. For those not familiar with the Holodomor — it was an intentional famine that the Communist Jews inflicted upon Ukraine. The Soviet Union was a construct of Jewish Bolshevism that literally enslaved Europe post 1917, but sucked dry Russia, Ukraine and the Balkans more so than any other area. You are starving? This is not famine yet. When your women start eating their children, then you may come and say you are starving. Indeed, Holodomor as a Jewish construct did drive people to cannibalism. BTW — Ukrainian Holodomor was not Jewish first such intentional genocide of a people. It was a repeat of the intentional famine that the Crown Jews inflicted on India (look up the Great Bengal famine of 1770), and the intentional famine that the British inflicted on the Irish (look up the 1845 – 1850 holocaust in Ireland). Whenever the Jews are involved there will be intentional famines, but the blame deflected away from them. Jews still orchestrate famines today, with only two things being different — now they call them “sanctions” and instead of stealing the food from the Gentiles, Jews prevent food and medicine from being delivered to them (Jew Madeleine Albright thinks the intentional famine that lead to deaths of half a million Iraqi children is worth it). The Atlantic, in 2008, and the U.S. military’s Armed Forces Journal, in 2006, both published widely circulated maps that closely followed the outline of the Yinon Plan. Aside from a divided Iraq, which the Biden Plan also calls for, the Yinon Plan calls for a divided Lebanon, Egypt, and Syria. The partitioning of Iran, Turkey, Somalia, and Pakistan also all fall into line with these views. The Yinon Plan also calls for dissolution in North Africa and forecasts it as starting from Egypt and then spilling over into Sudan, Libya, and the rest of the region. They have another useful idiot slave in power in Jew York. Jew York Mayor Bill de Blasio on Friday said defending Israel was part of his “job description,” and urged Washington to boycott Saudi Airlines for denying Israeli citizens the right to fly with them. He has been praised for his support for “justice” in the AMIA bombing case, in which he had implicitly sided with the Argentinean Jewish claim that the bombing had been carried out by Iranian agents before the case came to trial. Wow!! Bro. Nathanael, you’ve done it again. An A++ goes out to you, as each article you posted has been outdone by the next, etc. This latest one, focusing on Iran and Syria, has surely outdone your previous articles. The worst error the UN has made was bowing to IsraHell’s demands to disinvite Iran to the Syrian peace talks in Switzerland. Secretary General Ban Ki-Moon deserves to be sent packing, back to Korea (preferably the North) for his cowardice and incompetence. He’s not very smart, for a Northeastern Asian. He should have stood his ground and told US Secretary of State John Kerry aka Kohn that the original invitation to Iran to join the talks stood, regardless of what Kerry (Kohn) told him on behalf of Bibi Boo-Boo in Tel Aviv. Shame on him! His cowardice and incompetence is just more evidence that the UN is not much more efficient than its predecessor, the League of Nations. What a joke; except, that this is NO joke; it’s deadly serious. What the UN — if it’s going to survive at all — needs to do is replace Ban Ki-Moon with a Secretary General with integrity and courage; then, protect the sovereignty of all nations worldwide. KathJuliane, your current post is an eye-opener. You’re right; very few, if any, people know (knew) about the Great Iranian Famine of 1917-1919; or, that Iran had been occupied by British forces at that time. The history books on that period were engrossed with WWI, the Ottoman Empire, and Germany. You must have had to do a lot of online research to find this golden nugget. I need not mention who was really behind that famine; Josef Stalin repeated it with the Holodomor of 1932-34. Nicolae, your current post is another eye-opener. You’re the second person to mention Jew York’s new Mayor Bill de Blasio. What a nutjob he must be, and anybody who voted for him must also be crazy. I thought ex-Mayor Michael Bloomberg was a fruitcake; but, Blasio outdoes even him. If he really thinks his job is to defend IsraHell, he should resign, convert to Judaism, renounce his US citizenship, and go live in IsraHell; and, perhaps, he’ll receive citizenship there. Israel - Baptists dream of dancing the hora in the streets of Jerusalem while Israelis dream of getting the ‘h’ out of their claustrophobic penned-in state via either holiday in Europe, or better yet, a good job in Jewmerica. Only by ridding Jewmerica of JEW control can the Constitution be restored. Ukraine - A Nato/Soros/NED Jew-funded opposition to a Russia-leaning Ukraine is unfolding with violent protestors in the streets who if in America would have been forcibly suppressed in an instant for their violence. 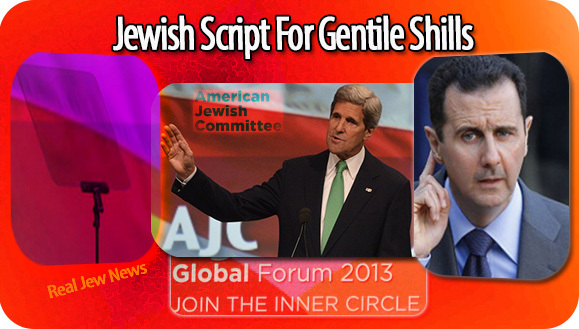 All statements by Jew-owned hacks in Jewmerica such as Kerry’s “we support the people of Ukraine” are PURE hypocrisy. A battle between the decadent Jew-ruled West and the Godly Orthodox Christian East is being waged. I will be doing an Article on this subject soon. Germany - Holds the cards between playing the Jewmerica game or moving Europe toward Russia and the Brics. An emerging Germany as a world power will release the Germans from the chains of wicked Jewry with an accompanying interest by Germans of their recent history post-Weimer which free-speech hating Jews have been successful in suppressing. Jewry’s rule in Germany will not last. I will also be doing an Article on Germany soon. We have listed the Hall of Stooges (or whatever these folks are known as). How about a short list of alternative writers putting forth some worthwhile articles and/or interviews? I know that some are critical and skeptical of Veteran’s Today (VT); nonetheless, I’ve ran across some hard-hitting pieces through that online source that punch Jewry right in the snout. At the top of my list is a young African-American writer named Jonas Alexis, a guy who has to be one of the most clear, critically-thinking black males in this country. For a young man with both courage and sound analytical skills, he is amazing. Another writer of sound intellect and courage is Preston James, PhD. While James may appear somewhat outlandish in some of his accusations/conclusions, he is still one who does not hold back. He goes right after Israel, international Jewry, and Zionism with sharpened fangs! Also, let’s not overlook Alan Sabrosky, PhD, who on the Mark Glen show several years ago argued that with 100% assurance Israel’s Mossad was behind 911. Mike Harris too is a figure worth noting. Although no one matches Brother Nathanael in specifically naming the names, I think it would be a worthwhile measure to recognize others who have written pieces worth reading and reflecting upon or who have boldly revealed truth in interviews. Who is NOT afraid to use the JEW word? Reverend Ted Pike; Dr David Duke (Yet uses the Zionist word way too much instead of the JEW word); Dr Kevin Maconald; Mark Weber; Gilad Atzmon; Michael Collins Piper; John Friend; Tomato Bubble Website. I have a friend who is dating a girl whose family is from Ukraine. She appeared to be excited about making a trip to Ukraine, but we were all trying to warn that might not be safe right now. I do need to state something about the Holodomor. Ukraine sought independence from the Soviets. While the Soviets were rationing food, the only way that the Ukrainians could survive was to not tell the Soviet Reds where their grains were. The Reds found out and then the Red Army positioned guards at the grain posts, where the Ukrainians then did not have access to and were intentionally starved to death. The Jews decided after WWII ended to place civilian deaths that occurred in Ukraine against Germany when it happened in 1932-1933 and those are the pictures of starving people that make people think that Germans did that to people (it was the opposite: that was the Red Army in Ukraine). Any Ukrainian will tell you once you are friends exactly what happened. You also mentioned the intentional Great Bengal Famine and the Irish Potato Famine that were both intentional acts of starvation against people by the Jews. I would like to add the intention starvation of Mao upon the Chinese as well. In regards to Ukraine, it is asserted that there was enough grain there to feed the majority of this planet (supposedly). Then ignorant people actually wonder why we are terrified of the Jews. It is clear that Egypt is having severe problems as well, as one of my friends is from Egypt and she actually decided to go there for their health insurance than here in America and she was actually able to assert a legitimate reason as to why. Now onto the topic of Iran I suppose. It does take considerable research to find the Great Iranian Famine (1917-1919) amidst everything about WWI. It takes “a lot” of research to find that one. Excellent research! But then there is all of what happened in the 1950s, which the CIA did admit much later on that they placed that leader in charge of Iran. The interesting thing to note is that the US CIA was blamed, but it was Britain that was in control of Iran for a period of time. While their revolution might have been somewhat religious, I doubt that because of how angry the Iranians became by 1979. I am personally disturbed because of the situation with Iran. That is all I hear about … Iran … Iran … Iran. It has been so disturbing that people have even made a song mocking the US stance of this. Go to this link: http://www.youtube.com/watch?v=eLCfrhOrU2I. It should be noted that this is political satire and I do not believe that whole Albert Pike conspiracy whatsoever (those long sentences is what happened in Russia once WWI ended), but it is comical and makes a person consider why the Washington politicians want to act like this. 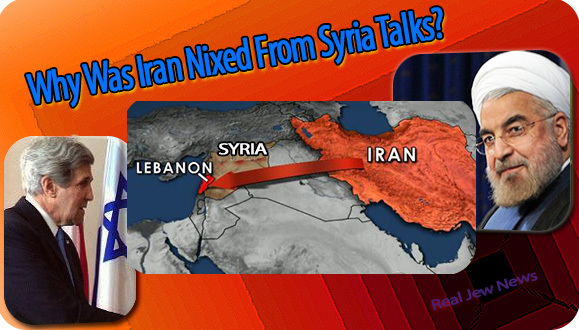 Of course Iran would be nixed from Syria talks. US politicians were not talking about Libya until after they were finished with Iraq. Even a child can understand this, but these discussions do not need to be made in front of children. +BN, I am sure that you are well aware that Bush declared war on Iraq on Purim Feast (March 19, 2003) and then Obama on Libya in 2011. Do you think that they might try to use Purim Feast for this one? These people need to stop, but they are going to destroy themselves. “Who is NOT afraid to use the JEW word? Agreed. That should be the primary test. However, those two from VT that I mentioned (as well as Mike Harris) have done so (minimally), but are not nearly as upfront in their use of the word as the names you have shared. Instead of stating “Jews”, typically the writer talks of Israel or Zionism. And there is no reason to sustain one’s reticence on the topic by refraining from stating Jews by instead discussing Israel or Zionism. We have learned that it is the tribe at the forefront of treachery, deceit, manipulation, and control. Therefore, they need to be named, and you have led the pack in doing so. Others need to start doing the same. I hear you loud and clear. I noted the name Mark Weber, but not Mark Glen. Don’t know anything about Mr. Weber and very little regarding John Friend, but am familiar with Mark Glen, the individual who interviewed Dr. Sabrosky several years ago regarding Mossad’s prominent role in 911. Seems to me that Sabrosky went out on a limb divulging what he confidently feels is the truth, even though he made very little direct mentioning of “Jews”. Tomatobubble.com always mentions the hidden hand of International Jewry as noted by Brother Nathanael. If a website does not mention Jews and Jewry in its analysis of world events, then look elsewhere. “The Ukrainian government was foolish to think that the so-called “opposition” (CIA-Soros rent-a-mobs) could be pacified by inviting a few of its political leaders into the government. This was the same fatal error made by many Kings and Prime Ministers of the 19th century…. Syria is just another country that the Jews in the West want to control and keep for Israel’s interest. The same thing is happening in the Ukraine. The Jews want to control the Banking and Media and could care less about the protesters. DrKatesView also protects against criticism of Jews. She chooses “Illuminati” or “The Powers That Be” or “The Elite” which seems to build them up, when in reality they’re a few dumb psychotic uglies (Foxman, Feinstein, Lieberman) exerting influence by position, not numbers or intellect. Do not confuse evil with intellect. I’ve read in several places that Reid and Pelosi were born Jews and are crypto-Jew poseurs, which makes perfect sense when you see that evil-ugly on their faces. Thanks. I’m well aware of the Ukrainian famine and whatnot. Half of my family is Ukrainian. I am suspicious of the boxer Klitschko who declared himself protest leader. He gives me a bad vibe. especially since he was offered a place of power. In his latest “conspiracy fantasy” on Muslims In America, Hodges is claiming that Russian troops in the state of Georgia are “harboring” Muslims in order to subvert the US. STAY FAR AWAY from this idiot Hodges. He’s making money out of spreading lies, disinfo, and fantasies of his own conspiratorial imagination. I have alerted Jeff Rense regarding Hodges’ NONsense in so far that the man is giving the growing alternative news movement a BAD name. It’s shaping up as one of my best. Hope to have it up Tuesday, latest Wednesday. New Article On Ukraine To Follow! I’ve got the Real JEW scoop on the Jewish subversion of Ukraine via info coming to me out of Germany. In America, deceased President Ike Eisenhower is honored. Few know, or would believe, that he was called “the terrible Swedish-Jew” in his West Point yearbook. He was certainly not the first Jewish President of the USA. Here is one of Eisenhower’s great accomplishment’s after the war, and after Germany had surrendered. This was perpetrated against innocent civilians: mostly women, old men and children. This is a holocaust that we never hear of. Eisenhower was involved in numerous atrocities, which were covered up. Eisenhower was instrumental in planning and executing the 1932 Bonus Army attack against his fellow servicemen and veterans of WWI, including their wives and children. Several were killed and others were seriously wounded. The attack was led by General Douglas MacArthur who commanded infantry, cavalry and tanks against the unarmed, peaceful veterans and their families. MacArthur destroyed and burned the shelters and meager belongings of the veterans. Eisenhower went on to rise to “fame” in WWII, where he planned and directed the war and its outcome along with his fellow comrades of Jewish descent, such as Trotsky, Lenin, Stalin and Churchill. WWII established the foundations for the current situation in the Middle East. I definitely have to respond to how they call themselves the “Illuminati” now. First of all, if anyone is afraid to say the word “Jew,” I do not listen to them. It is because they are under the influence of the Jews and they are not going to expose their criminal activities. They are phonies. Even when they discuss Zionists, that appears to be yet another cover-up. The difference between the Zionist Jew and the Jew against Zionism is that the Jew against Zionism is easily able to attack the Zionist Jew for their horrible and criminal activities, while the Jew against Zionism is also involved in criminal activities that are slightly different than their counterparts. In other words, the Zionist Jew actually gets attacked more than the Jew against Zionism, when the Jew against Zionism is probably severely more dangerous than the Zionist Jew (both of them are terrifying for sure) … read all +BN’s articles on the Russian Revolution, Armenian Holocaust, and Ukrainian Genocide. To discuss what I have learned in my research on this “Illuminati” discussion. It is obvious that the Jews created Freemasonry to start up the French Revolution, in which to deceive many French into delusion that had no intentions of murdering Louis XVI and then tried to save him (they were then either poisoned or exiled when they tried to save Louis XVI) … that is a dangerous group. Regardless, Freemasonry did not appear to be a success for them … Hitler was the one that shut down the Freemasonry Lodges in Germany by the way. Then the books by Dan Brown come out, which obviously are fiction and talk about the Illuminati. Then they have all sorts of things all over the internet about the Illuminati. Through my extensive research, these people that believe this are ignorant. It is the Jews … again (what else is new?). There is no difference except for the fact that they go by a new name because their Freemasonry did not work out for them. That does not discount the fact that they are terrifying though. It’s just a different name. The only validity of truth that I have found concerning Adam Weishaupt is that he was a Jew, whose parents were killed, lived in Frankfurt and he joined up with the Mendelsohn’s concerning the “Diamond Necklace” scandal during the French Revolution. That is the only truth and validity concerning this man and it was so severe for Bavaria to hear of these plans against Louis XVI that he was stripped of everything in his life by the German Government for that. But the financing of the French Revolution actually came from English Jews (makes sense once you understand that the French and English did not like each other until approximately 10 years prior to WWI). They certainly expose Weishaupt, but never mention the “innocent English Jew,” do they? I have therefore concluded that anyone that praises something like an “Illuminati Grandmaster” or talks about the “Illuminati” is either a poser or a very deceived and blind individual, just as the French Masons had no idea what the real plot against Louis was. You’re right. Harry Reid and Nancy Pelosi were both born Jews. Dwight Eisenhower was also a Jew. FDR was a Jew, where Teddy admitted that during his career, but FDR never talked about it during his horrible dictatorship of America that took America against the true fighters against communism (what is the suicide total of America during the Great Depression for that matter?). There are many places now that openly expose the Jews and it is growing. These are people that are not afraid to use that word and because of the way the criminals operate, this word is never used by anyone in contact with them obviously (unless Israel because that is assumed to be the same as when two black people are in an argument with each other). That is how I am able to catch a phoney at least without wasting my time. But the number is growing, which could be considered anti-Semitic, but I would not consider historical evidence, validity, and proof to even be deemed with such a word: truth is truth and I find no reason to change truth into falsehood and falsehood into truth. More and more people are catching on, which is good for America because it takes Americans that are no longer brainwashed for a false liberalism (liberalism does exist, but not in the terms that they are giving … life is hard … get over it). It is possible for America to take back America, but they have to stop listening to these people and act … which means take America back. I fear that even in Putin’s Russia, there could still be some hidden portions that he is not aware of in the disguise of democracy, but it is truly only Marxism. I say this because he clearly has been getting ready for Winter Olympics and appears to be very devoted to restoring a destroyed Russia, while the Jews caused all of that and they do not appear to like him at all. But I am happy for Russia and the fact that they have vastly improved (long way to go, but they have come a long way while we are going straight down the tube because of the same people that took them down). I disagree with the view on David Duke. I think he was simply raised differently than all of us concerning “choices of words.” We all talk the same way, but he might be accustomed to different words for speech and he did mention that once he was upset over the Jews and spoke out against this, they not only labeled him as an anti-Semite, but they also tried to tell him that train of thought is what led to the death of 6 million Jews. If only they knew the whole world have talked like this for 2,000 years, they would surely think differently. If my assertion is true, Duke will be alright. I’m not sure how this conversation changed from Iran/Syria to about the group now known supposedly as the Illuminati, but it happens. I would suspect that war mongrel McCain will step up (still never recovered as a Vietnam prisoner obviously) and will try to get some brownie points. It will be interesting what the Jew York Times has to say next. Haaretz continues, “despite having a Jewish community 20 times smaller than that of the United States,” 59 British MPs are Jewish: 18 in the House of Commons and 41 in the House of Lords. After Britain and the United States come France and Ukraine. Look at the Grammies with Perry’s satan-worship stage act and Beyonce’s “pervert the Goyim” gynecology act. As Miley Cyrus posed, “What’s all these 70 year old Jewish men doing in the music industry?” The Jews clearly have “gotten to” most celebrity musicians (who do those dumb baphomet hand-horns, pyramid, covering one eye — symbols). I even saw Michael Buble do the hand-horns, a nice Christian boy from Vancover BC of all things. And Madonna attends kabbalah classes and calls her African adopted son a “N” (schwartza). They get to them all, the musicians either abide and prosper or they get an “accident” a la get Michael Jackson or Whitney Houston. I don’t know what these old perverted Jewish men are thinking. That if they display musicians’ genitalia and Wizard of Oz flames that this will bring on Moshiach, Lucifer, pervert the Goyim some how some more? In any case, the sad Jews behind this clearly are psychotic/schizophrenic/IQ-impaired to actually believe/live/push this crud. They must “instruct” their Goy-musician-schleppers in perversion and shock, and enforce the display by threats. But there’s really hardly anything left of shock value unless they’re going to do a live goy-child Purim blood ritual on a marble altar or something. Ootherwise all that’s left is maybe an onstage colonoscopy or pap smear after Beyonce’s act, jeez. I guess that’s their intent, normalization of perversions so they can amp up the grosteque-ness. And speaking of amping up, the Jews really want to implant (tatoo-on, make us swallow, latch on) tracking devices. I’ve been seeing the enemedia yuck it up about all kinds of ways to keep the Goyim-cattle tallied and herded. Chuckie Schumer thinks if he starts by pushing tracking devices on senile geezers and autistic kids that’s a good foot in the door. He’s pushing “Avonte’s Law” in NY; watch next he’ll want them “required” as “responsible” overseeing (step 1) nationwide. I completely agree with you. Your level of knowledge is very high. This clearly explains all of the drug overdoses and tragedies of both Hollywood and the Music Industry as well. I was doing some thinking about 9/11 and what I am about to say is extremely important. This should be an eye opener for all readers. Back in the 1980s, there were some police officers that were engaged in cocaine-trading with Columbia, South America. This was being transported to a suburb outside of the city that I was living in, but the ring leaders lived in houses that were within one to two blocks of where I lived. All of this is documented in the infamous book “The Bluegrass Conspiracy.” We are not hiding anything. They all went to jail. Anyways, I was 8 years old watched dead people fall out of airplanes with bags full of cocaine strapped around them while I would be playing in my backyard. My parents pulled me in the house because it was not appropriate for a child to watch. Once this occurred (also well documented), a search warrant then went out by the Kentucky State Police, which the FBI did state that they would help this situation, so the KSP and FBI were both in our neighborhood in 1998. The ring leader turned out to be a man by the name of Osama Shalash. If you google this in, you find out everything I am saying to be the truth. Everyone in the Bluegrass does stay away from the Shalash’s, but we are neither rude to them and they are not rude to us. We just simply don’t like each other. All of this occurred between 1998-1992. So then I was thinking that since this is very well documented if “crazy people” actually decided to get the entire idea of doing to New York on 9/11 from researching what happened under the Arab Shalash’s and also the Bluegrass Conspiracy, which is a true story by the way. This of course makes me skeptical because people within the Bluegrass knew it was true (small town, everyone knows everyone, no secrets, everyone was upset and wanted the Shalash’s gone when these police officers went to jail over all of this). Are you seeing the similarities? The people of the Bluegrass are convinced that the Jews got their ideas to plan for 9/11 by watching the real autocracies that did occur in the Bluegrass in the 1980s. Believe me or not, but you can clearly see our point of view. The difference is that we sent every single one of them to jail, but the people involved in 9/11 have not gone to jail. Once we heard the name “Osama,” our response was, are the Jews creating a new Osama? Anyway, it might be enlightening for the Yankee Gentiles to understand this, because almost everyone in the Bluegrass knows better than to believe their hoax story because we’ve been through it long before New York got hit and we are very familiar with this topic. So I wanted to pass that on. Excellent comments by the way. I hope that Hollywood can get cleaned up.